Paige Billiot from Los Angeles, California, was born with a dark red birth mark covering the left side of her face, along with her neck and ear. 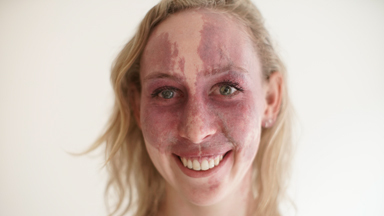 Her birthmark, also known as a ‘port wine stain’ or ‘firemark’, is a permanent discolouration of the skin caused by an abnormal formation of blood vessels. After being bullied for her appearance growing up, the 26-year-old budding actress has now launched a body-positivity campaign to empower others living with differences or imperfections. Paige told Barcroft TV: “School was tough. There was a definitely a lot of bullying. Elementary school predominantly was a big challenge. It was definitely a roller coaster. “We all know that kids can be brutal. It was really difficult for me to just have somebody to see me and not just my birthmark. Paige admits that although these harsh experiences affected her self-esteem, eventually, they helped her to become stronger. Port wine stains are found on the head and neck in 65% of cases and affect three in 1,000 children at birth. Girls are also more likely to be born with these birthmarks – but the reason for this is still unknown. Port wine stains can sometimes fade after undergoing sessions of laser therapy, however this treatment will never erase the birthmark completely. 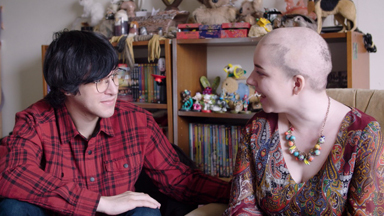 Paige’s online campaign, called the ‘Flawless Affect’, started out when she began taking artistic photos of her birthmark and posting them online. She said: “I wanted to create a platform for something that could be essentially a community of people not even with just birth marks. Three years after starting the campaign, she has amassed over 15,000 followers and has been involved in numerous media projects. She also says that the campaign has helped her regain confidence in herself. 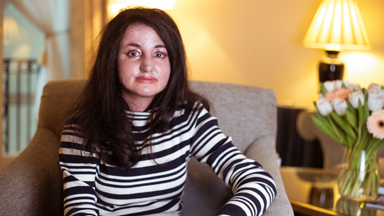 “Now I feel that I can do anything with my birthmark and go anywhere”, Paige continued. “I am more than happy with how I look, I go everywhere without make-up. Paige hopes her campaign will contribute to promoting a more positive body image among young women, or any individual who is struggling to accept their flaws. She said: “I can see this campaign has already been truly amazing and has been very motivating to keep pushing and to get bigger and better. “We want to create a new trend for sure, and we want that trend for people to just be happy in themselves." Paige has been sponsored by the lingerie brand 'Curvy Kate' off the back of her campaign, and now has big plans for the future. “It would be really amazing if someone were to walk into a lingerie store and see women like us feature on the lingerie,” she added. “I have a lot in mind that I want to do with this campaign – I want to take it very far. I want this conversation to be heard everywhere. “We need to talk about it as much as possible and raise awareness about birth marks and literally anything that makes you feel different and makes you feel flawed. Barcroft Media would like to thank Mariya Stangl for her photography on this project.